Ferrier Baudet Architects with Artist Lincoln Austin were this year’s winner in the Art and Architecture Category in the Australian Institute of Architects State Architecture Awards, announced on the 22nd of June in Brisbane. The work consists of a refurbished covered entry and entry foyer and the art work called “Correlate”. The original aluminium framed glass wall and doors were replaced with an art work created by Lincoln Austin, and frameless glass entry doors. The commission brief for the art work asked that the artist come up with something that would ‘fit in’ with the existing architecture rather than compete with the architecture. The result is a three dimensional grid of cubes made up of glass and mirror in a stainless steel frame. The work’s theme is ‘Relationship and Celebration’, being a celebration of the relationship which has bound the University and College over 93 years, a celebration of UQ’s Centenary year 2010 and symbolic of the healthy relationships which bind the St Leo’s community, giving it vitality and strength. The work is an assemblage of individual units that together form a cohesive fabric. 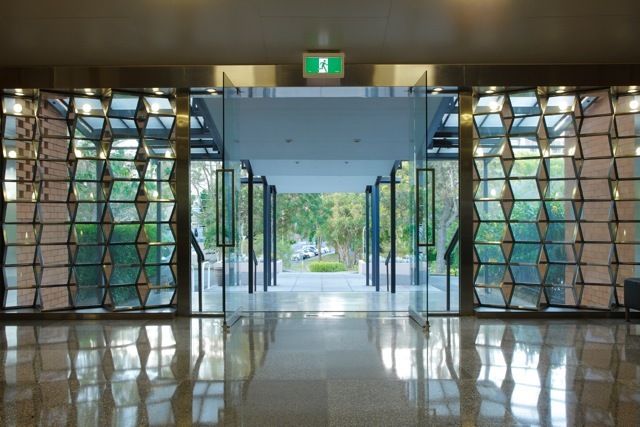 As the primary entrance into the college, the artist felt it was important to obstruct the view both into and out of the foyer as little as possible. Glass was the obvious choice of material that could provide the necessary protection from the weather and an uninterrupted view. Frameless glass entry doors have been installed which virtually disappear, leaving the artwork to dominate the boundary between the outside and the inside. The architects approached several glass manufacturers for this project, but the only company prepared to work on this unique installation was G.James Glass & Aluminium. The work was a true collaboration of architect, client, artist and fabricators and resulted in landmark artwork which will be enjoyed by many now and in the future. The work received a $50,000.00 Art and Place Grant from the Queensland Arts Council – a Queensland Government initiative. The original concept by the artist Lincoln Austin did not specify how to implement the idea. Lincoln produced a small three dimensional model made from cardboard and plastic to demonstrate what was desired. From there, several meetings with the artist, architects and G.James arrived at a design based on 25mm stainless steel square tube with glass and back-to-back mirrors. G.James then produced a full sized sample of half a cube with a number of options for the alignment of the glass panels. The artist elected to have the glass centred in the stainless steel frame, so it would look the same from both faces. Calculating the dimensions of the cubes, to ensure there would be even spacing in both horizontal and vertical dimensions was a particularly difficult process – this was only achieved with the addition of stainless steel plinths on the top and bottom of the structure. The artist was a pleasure to work with, he had strong ideas and concepts, but readily accepted advice from G.James – particularly regarding the structural integrity and safety concerns we identified. The original concept was a frameless installation, utilising UV glue to hold the structure together. Unfortunately this concept posed a significant financial risk, as any damage that occurred to the glass would not be repairable – the whole structure would need to be scrapped and started again, as individual panels in this configuration could not be replaced. The construction of the stainless steel frame was contracted out to a third party. The stainless steel was welded in each corner, and then carefully polished so the welds would not be visible. This was a time consuming and costly process, so it had to be done right first time. The vision glass used in the cubes was 12.38mm clear laminate, while the mirrored faces were two pieces of 6mm annealed silver back-to-back. The combination of mirrors and clear glass gives a changing appearance as the entry is approached. From a distance most of the panels seen are the clear laminate allowing visibility through the structure. On closer approach, the viewing angle increases, and only the mirrored panels are seen – thus changing the view to a reflection of the outside. Creating panels that were mirrored on both faces was one of the more challenging aspects of this project. This was achieved by cutting and edgeworking 6mm mirrors to the exact same size and then manually gluing the mirrors together. 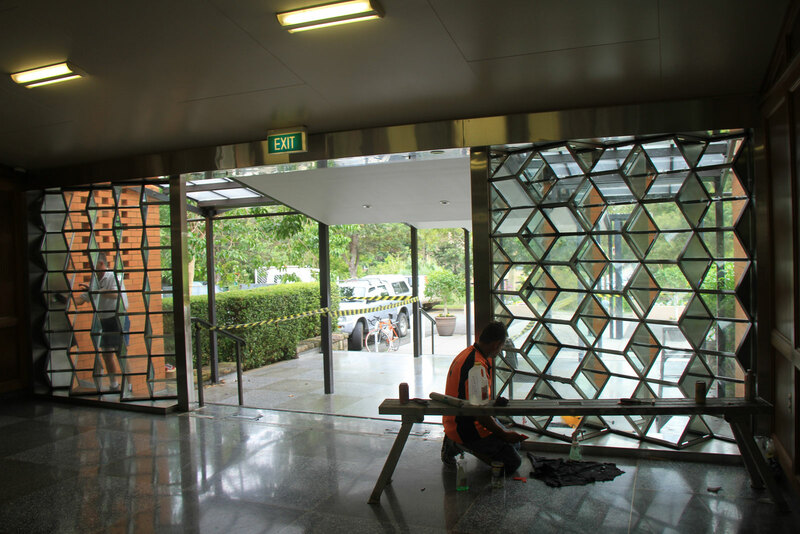 The mirrors and clear glass panels then had to be structurally glazed on all four edges to the stainless steel frame. Custom designed brackets were made to hold the glass in place until the silicone cured, the brackets were then removed and the silicone completed. Due to the size, weight and fragility of the artwork, it was glazed onsite. The frameless entry door was typical of many seen in shopfronts. It was made difficult however as the floor sloped up on the inside of the building (approximately 25mm over the length of each door). As the doors are opened in, this results in larger than normal gaps under the doors. The two doors also have a large sandblasted pattern on them with the logo of St Leo’s College. This entry was posted in Doors, Glass and tagged artistic, frameless door. Bookmark the permalink.